Finishing isn’t just the final slog of assembling the pieces – it is the details that make the design. Choosing the right way to finish a project really starts at the beginning. 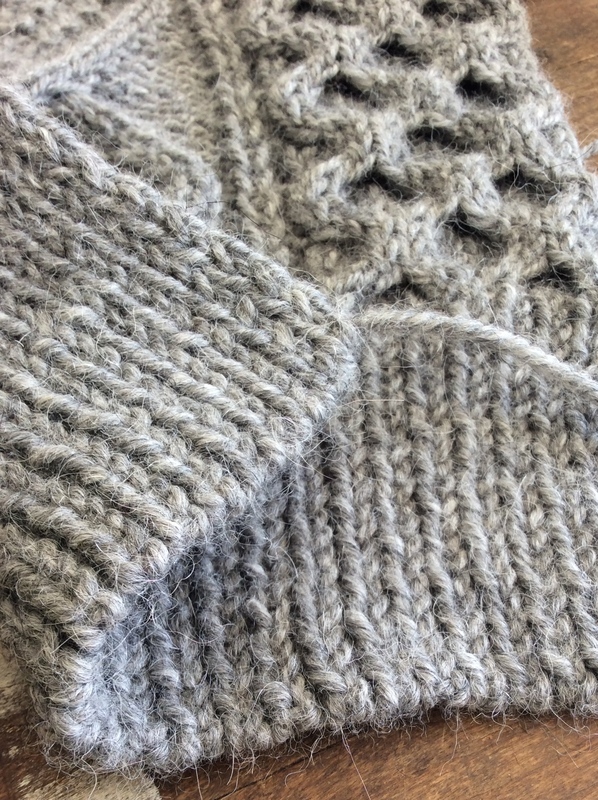 The right cast on complements the bind off and the finishing techniques. Having already invested so much into this project just choosing a color, I’m not about to waste that effort and not be completely thrilled with the results. My go-to cast on is almost always the long-tail method – it is stabilizing and resilient at the same time and works well with nearly any stitch pattern but it isn’t always the best possible choice. Because the hems and cuffs of this sweater are worked in a 1×1 rib, I will use a tubular cast on instead. A tubular cast on is a decorative detail that can really elevate the look of a knitted garment finished with 1×1 ribbing. You see this cast on on a lot of ready-to-wear and machine made knitwear. It is extra super stretchy (so don’t use it for your hat brims) and completely reversible – the front looks exactly like the back. Always go down a needle size or 2 from the suggested needle for the 1×1 rib. If this method is new to you try practicing with a chunky yarn so it will be easy to see how the stitches are sitting on the needles. Another trick I like is to work the ribbing on a smaller needle, too, meaning – if the gauge needle is a US 8 and the ribbing needle is a US 7 – when I work ribbing with a tubular cast on I switch to a US 6 instead of the 7, this keeps things neat looking. I love those cables 🙂 Interesting to hear about the tubular CO being good for 1:1 ribbing- I haven’t tried that as I also have the long tail CO as my default. You say it would be too stretchy for hats- how about socks? Excellent for socks!! I like it for mittens and gloves too. Very interesting! Thanks for sharing the information. I will have to give this a try! Do you think you could post a video for a 2×2 tubular cast on? ?I’ve yet to come upon one that is clear video and distinct direction.